Published on 25 March 2012. 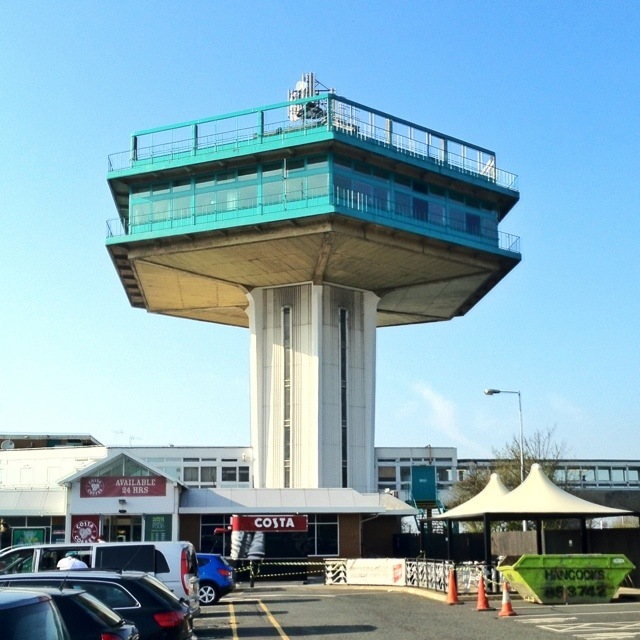 This is the hexagonal Pennine Tower at Lancaster Forton services. It was built in the 1960s, and I think echoes the excitement of the new motorway system back then. The tower used to house a restaurant, so popular in its day that it’s said that even the Beatles visited. Unfortunately, it has been closed since the late 1980s due to the inadequacy of its fire escape. However, it’s unusual hexagon lifts remain in place, and transport visitors between the ground and first floor of the main service building. There’s some great history of the Pennine Tower on this fan site, including some brilliant “then and now” comparisons of the top of the tower in it’s heyday and in 2008. This 1,581st post was filed under: Photo-a-day 2012, Lancaster, Motorways.